Batik is a craft that has high artistic value and has become part of Indonesian national culture. Javanese women in the past made their skills in batik for a living, so in the past batik work is exclusively women’s work to be found STAMP BATIK. The tradition of batik was originally a tradition handed down so that sometimes a motif can be recognized from a family of batik artisans. 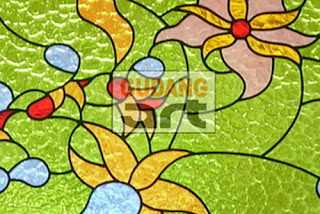 Craft Batik Indonesia is so diverse that innovation born Batik Handicrafts Glass on glass media which is then soldered or known to the art of stained glass in hopes of raising Batik Indonesia and love the product itself. As an ancestral heritage of batik Indonesia will become the nation’s pride, When Batik receive recognition and appreciation of UNESCO, stretching Batik struggle to succeed in any market share is not a short time had decades to fight his fate Batik craftsmen in order to get good chances in the eyes of all consumers of the National and in the eyes of the International.